When shopping online, the last thing that you want to see is a product description that tells you absolutely nothing about the item itself other than what you can plainly see in the picture. I kid you not, I once saw a beautiful piece of pottery on Etsy that was super detailed with color and a mosaic-esque design with the description “round bowl”… WHAT?! Not so exciting. So naturally, I was determined to make this the next blog topic in order to put a stop to this heinous trend (if nothing else but to save my own sanity). 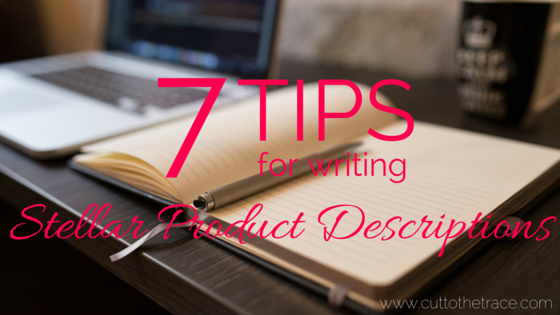 So, my friends, here are 7 handy dandy tips & tricks to help you with your own product descriptions! 1. To catch the attention of the customer. 3. To convince the customer that they need the product/the product serves as a solution to their problem. An awesome trick to use when spelling out the details of a product is to follow this formula: By highlighting a feature plus a benefit, you can give your customer the general impression of quality without bluntly stating so. > Iron base is supported by elegantly curved stretchers. > Three removable enameled-iron trays feature raised lips to keep objects in place. > Handles provide easy re-positioning. > Finished in polished nickel. > Catalog / Internet only. If you look at their bullets, you’ll see where they talk about the “three removable enameled-iron trays featuring raised lips (feature) to keep objects in place (benefit)“… SEE?! It totally works, and you can apply it to anything! What problem does it solve? It “keeps bath essentials organized” without having to sacrifice style and conveniently “aligns with the top of a standard tub”. What is the product’s appeal? By calling it a “stylish étagère”, they gave it a nice European spin. Because using french is MUCH classier than just calling it a “stylish shelf”, non? What desire is there to buy this product now? While this particular example doesn’t necessarily create a sense of urgency, it does give the impression of exclusivity by declaring it to be available by “catalog/internet only”. When selling online, you must always bear in mind that customers cannot physically hold your products. This means that it’s your job to create vivid descriptions using sensory words that speak to your customer’s senses and imagination, allowing the potential buyer to envision themselves in a scenario where they are using your product to fulfill their need, whatever it may be. Most online shoppers will tell you that one of the biggest influences in their decision of purchasing a certain item, is whether or not a friend recommended it to them (or maybe they saw one of their thousands of closest Facebook friends mention something about it that one time). Keeping that in mind, why not throw a customer review or testimonial into your description? If one of your products has been previously featured in a magazine or well-known online forum, consider adding a tagline such as “As seen in…“. Does one or two of your products sell considerably better than the others? Don’t be afraid to add “Customer Favorite” and showcase that it’s one of your more popular items. All of these tactics can, and should, be used in order to increase credibility and consumer confidence. Everyone will claim that their product is the “best” or the “easiest” or the “fastest” so, unless you can prove that your claim is true, it’s usually best to stay away from using words like that so you don’t take the chance of being perceived as insincere. The last thing you want your customer to be thinking when reading about your stuff is “Yeah yeah, sure….“. A great way to keep your customer’s interest is to incorporate some “personal” or “behind-the-scenes” info. Whether it be about the product itself or the process of creating it, people love knowing a little extra about the items that they buy! (Bragging rights, ya know?) So ask yourself- What was the inspiration for creating the product? Who physically makes it? What obstacles did you have to overcome? This approach is an excellent way of simultaneously educating the consumer about your products, while also making them forget that they’re being “sold to”. These suggestions and methods are only a few out of many in order to make your product descriptions “headline-worthy”, but they’re a good start! Do any of these options stand out to you as being especially helpful? Are there any tips that you think should have been included here? Spread the wealth people- share your expertise in the comments!